Presented before you is yet another example of ignorance is bliss. Seeing as how misery loves company, we will encourage you to read on, discovering the extent and wide coverage of just one sneeze on an airplane. We already know the answer: You get angry looks from bystanders and an apathetic “God Bless You” from some guy two rows back. Perhaps we took the question too literally, because the report visualizes how particulates move about the cabin the instant a passenger sneezes, offering a video that illustrates a dreadful blast zone in colors that almost make you forget we are talking about mucous here. Is it bad luck to open an umbrella in an airplane, because that’s where we see our personal travels headed? So relax, because this is merely to show how one might get the flu, a cold or inadvertent drizzle that could ruin an otherwise pleasant trip. 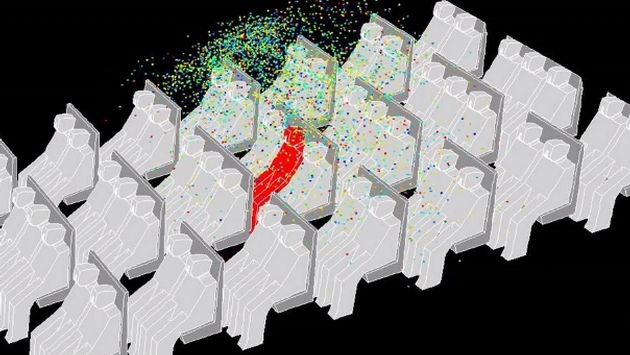 Now all kidding aside, ANSYS is working hard to illustrate how particulates travel throughout a cabin, hoping to eventually limit any contagion from something like a sneeze. While perfectly fine and dandy, we appreciate having full knowledge of a sneeze blast zone, knowing that it pays to be in front of a person with a cold instead of in back or to the sides. Those unfortunate to sit in the “high risk of infection” area, just imagine you are getting doused with rainbow sprinkles as offered in the video.